Seating is available to book through the Box Office. 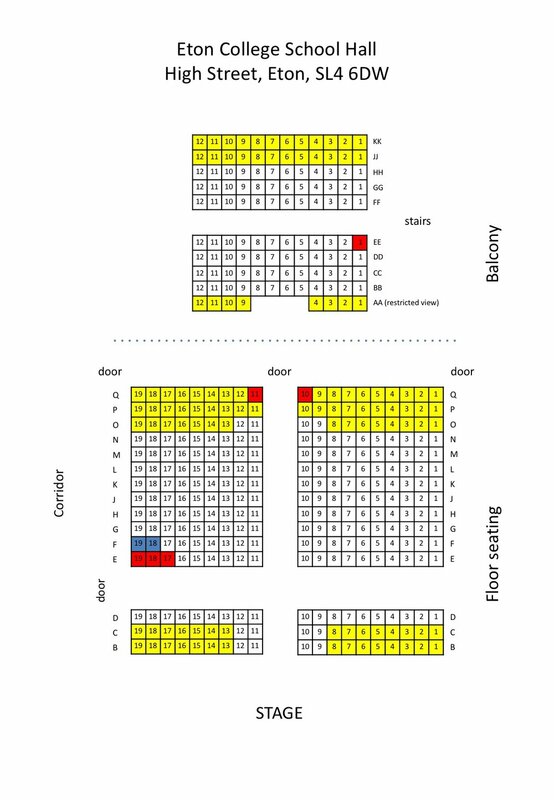 Clicking on the image below will show a larger version of the seating plan. SEATING: The sides, rear and parts of the performing area are at the raised access level. The main stalls seating area is accessed by descending four steps. PARKING: On-site parking is available. Enter by the main school entrance and keep to the left. Parking (and the Auditorium Entrance) are located to the rear of the school. The more distant parking places may have little or poor illumination. DISABLED ACCESS: St. Bernard's Concert Hall has step-free access via a ramp and separate entrance to the left of the main entrance. Wheelchair seating is possible at access level at seats JJ1, KK1 and these can be purchased directly through the on line box office. Please advise the box office if you are a wheelchair user by calling 0300 365 7445 and leaving your name and contact number. Crown Lane, Farnham Royal SL2 3SL The entrance is situated at the north (Farnham Common) end of Crown Lane. PARKING: On-site parking is available. Enter by the main school entrance and park as directed. DISABLED ACCESS: Centenary Hall has step-free access and wheelchair seating is possible at all aisle end, ground level seats and these can be purchased directly through the on line box office. Please advise the box office if you are a wheelchair user by calling 0300 365 7445 and leaving your name and contact number. PARKING: Those attending this event should note that parking is available in public car parks within the town of Eton. Eton College may provide parking by arrangement with the event organiser, but cannot guarantee that parking will be available within the College. Some public parking is up to eight minutes walk from School Hall and concertgoers are advised to arrive in plenty of time. DISABLED ACCESS: School Hall has step-free access via a ramp and separate entrance to the right of the main entrance. Wheelchair seating is possible in seat 19 in any row and these can be purchased directly through the on line box office. Please advise the box office if you are a wheelchair user by calling 0300 365 7445 and leaving your name and contact number.